Lanita Numina Napanangka built up her paintings talents while learning from her mother Barbara Mbitjana and her well-known aunts Kathleen and Gloria Petyarre. She was born on Anmatyerre country north of Alice Springs, on Stirling Station, and later moved to Darwin. Lanita Numina uses the well-established painting styles and forms developed by the Utopia artists who have been dominant figures in the Central Desert art movement for the past 40 years. Drawing on the rich tradition of shared ceremony and Dreaming stories, the Utopia women artists have created images that reflect the deep connection to the land and its resources. 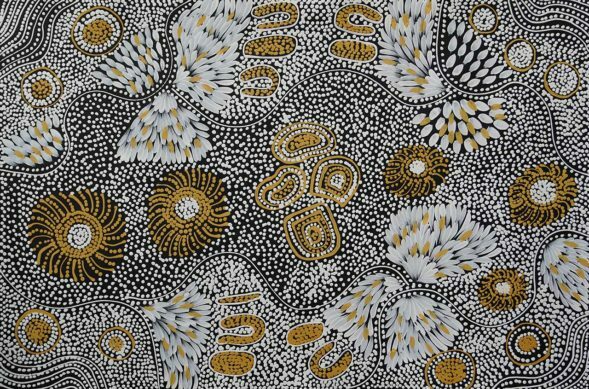 Lanita has painted stories related to Dingo Dreaming, Bush Medicine, Bush Tucker and Waterholes. Her artworks have been widely exhibited and collected.